Bomb explodes, mass hysteria, social media frenzy, countless casualties, tweets, prayers and tea lights, Islamophobia accusations, constantly told by left-wing and social justice commentators not to jump to any conclusions and… ISIS takes responsibility for the latest terrorist attack. This terrorist attack is slightly different however, as this one actually involved a real life bona fide popstar! Pop princess Ariana Grande was caught up in a terror scare during her aptly named “Dangerous Woman’’ concert with witnesses describing what they heard as a “massive bang”. The “Bang Bang” singer was unharmed with Grande said to be “in hysterics” but physically “OK” during the security scare, so all you little “Arianators” can breathe a collective sigh of relief. “Arianators” are the name fans of Ariana Grande lovingly refer themselves to in loyalty and devotion to their supreme leader and heroine, in case you was wondering. 22 Arianators sadly lost their lives at the event that evening and many others suffered injuries, some with life threatening conditions. The death toll might still rise. ‘Broken. From the bottom of my heart, I am so so sorry. I don’t have words.’ Were the only words Ariana could muster up after the truly tragic attack. 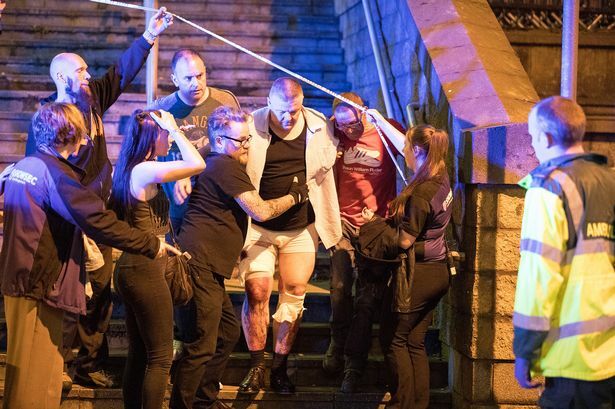 The “explosion” like sound caused initial wide-spread panic within the arena with frightened concert goers leaving their seats and rushing out of the Manchester arena in a hurried and panicked frenzy. 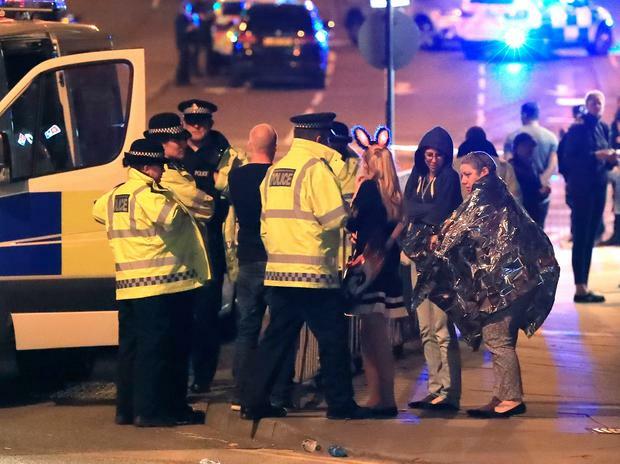 Greater Manchester Police initially warned people to stay away from Manchester Arena as officers responded to the incident, amidst reports on social media of an explosion going off. Speaking of Social media, the normal state of pandemonium began with theories and speculation ranging from gun shots, blown speakers and even to a popped balloon. Despite numerous attempts to put the finger of blame on evil balloons, ISIS social media accounts associated with the Terrorist Islamic State began taking responsibility for the deadly attack. Some ISIS accounts even posted out warnings and threats of the forthcoming incident four hours before it happened. Showing that it was premeditated by the Islamic State. As of writing this, the identity of the killer, which is being described as an apparent “suicide bomber” associated with the barbaric Islamic cult, has not yet been revealed through Police have confirmed that the suspect was known to them. Of course when the words “explosion” and “panic” are brought together in one sentence in a situation like this, the initial reaction is to think of ISIS, is it not? I mean, any logical thinking person would always come to this conclusion. But of course, as with all these kinds of tragedies we should never jump to any conclusions, because jumping to conclusions never helped us all the other multiple times that Islam struck in terror, right? So, what of Ariana Grande and her grieving Arianators? The process below will help you in portraying a sympathetic and lovingly wholesome image, plus to help you portray the holy liberal image of a social media humanitarian, you may even generate more friend requests or followers as a result. Remember, Ariana Grande has a staggering 45 million Arianators on her Twitter account alone, all currently in mourning and in utter sadness of the sudden loss of their own kind. This is a time when the Beyhive should unite with Beliebers and where Little Monsters raise up their paws in harmony and love to the grieving Arianator community. Here are 10 ways Ariana Grande could potentially put a stop to ISIS once and for all. Because, nothing strikes fear into the black hearts of Islamic terrorists more than love, tweets and Ariana Grande music. 1 – Change your profile photo to a photo of Ariana Grande of something resembling Manchester; perhaps in this instance a photo of the MEN arena would be more appropriate? Sorry Ariana but it can’t always be about you, this grief belongs to the Arianators and their family and friends. 2 – Send your digital prayers and remember to write that you are sending said virtual prayers specifically on your social media accounts, otherwise the prayers won’t work in deterring more Islamic attacks the next time they occur. Even though the tweets and prayers did nothing to deter the terrorists all the previous times, maybe, just maybe this one will be special, just because Ariana Grande is included? Remember, celebrity endorsements always add legitimacy and effectiveness to said causes i.e Band Aid, Live 8 etc. 3 – Don’t forget to add a fitting Ariana Grande lyric in your status or tweet today. These Arianators lost lives at the hands of Islamic Terrorism, so the least you can do is add an Ariana Grande reference in there, somewhere. 4 – Add praying hands and Gifs of Ariana Grande crying or looking sad to make your virtue signalling even more appeasing for someone’s news-feed. In fact, even if you are an atheist you should still include traces of religion, so that you do not come across as “Islamophobic” because it might offend Muslims. Remember, it is important to stay politically correct during these culturally sensitive times. Ariana Grande has Muslim fans all over the world, you know? Perhaps, she doesn’t have Islamic Extremist fans, though? 5 – Oh, and don’t forget to add some type of graphic for added sympathy, preferably something Ariana Grande related, seeing as it was at her concert where the terrorist attack happened (also it would be rude not to include her). 6 – Light a tea light (you can buy cheap ones from the pound shop or your nearest Tesco Super Store) for added creativity, so you can spell out an Ariana Grande song or lyric, ideally one that is in keeping with the sombre mood. Spelling out “Side to Side” for instance would be deeply inappropriate. 7 – Join a rally and attend a Virgil in unity and love with other Arianators. Remember to have Ariana Grande music on constant repeat, preferably a ballad as an up-tempo dance number would be deemed far too inappropriate for such a melancholy affair. 8 – Write an inspiring status that Ariana Grande would be proud of, stating that you won’t let the actions of a “few” deter you from living and continuing on with your life. During these turbulent times, it is important that ISIS do not see and feel your fear, even though that contradicts with point 7 on this list. Rest assured, it is important to remain calm at all times and carry on with your lives, as if nothing ever happened. 9 – Whatever you do, do not, I repeat, do NOT blame Islam in any way, shape, or form. In fact, do not even assume that Islam had anything to do with the attack in question, when in doubt blame a white Caucasian Christian male instead. Remember, Ariana Grande wouldn’t judge the actions of just a few, on a loving and peaceful religion like Islam, so neither should you. 10 – It is very unlikely that this type of incident will ever occur at an Ariana Grande concert again, especially with her beefed up security coming soon. Potentially it could happen at a Katy Perry concert however, in that case, just repeat the previous aforementioned steps, making sure to include specific Katy Perry references and songs. [Editor’s note] – We do not wish any physical harm on any “KatyCat” in any way, shape or form. Plus, we do not wish harm on anyone apart from ISIS, but what we do also really wish is that people will wake up and smell the coffee, thus finally addressing the problem with Islam , because lighting tea candles, virtue signalling and making social media posts in solidarity, will not help! If the 45 million Arianators and the millions of other musician fan communities from all over the Twittersphere came together in love and unification, maybe, just maybe we could potentially put a stop to Islamic terrorism once and for all, right? In the words of Ariana Grande… “I got one less problem without you” and together, we would have one less problem without ISIS. Sadly, we all know that the attack will not change anything. Ariana Grande will still remain ferociously pro-immigrant, pro-Islam and anti-America and ISIS will probably target another teen crowded concert in the mean time. These American celebrities really need to pull their heads out of their [Insert inappropriate term] and start to support their President, Donald J. Trump, for he has been right all along, on Islamic Terror and on Immigration Control. How many more tea lights need to be lit and how many more praying hand emojis need to be posted until enough is ENOUGH! ?